Two years ago, a member of the Chobani family, whom I'll call Eric, moved to the small village of New Berlin in upstate New York in search of opportunity. He came with almost nothing but found a job at our plant working in our packaging department. Over time he worked his way up from an entry-level position at $12 an hour, which is well above the current minimum wage. Today, Eric is a homeowner, a car owner and an active participant in our local community. It's everything he hoped for, and it's everything we hope for when someone joins Chobani. There's a longstanding debate across the country facing business and political leaders: How do we ensure that people like Eric and his family have the chance they need to succeed, or even keep up? Every working family should be able to buy nutritious foods, fruits and vegetables. They should be able to make the rent and live in a safe, stable place. They should have access to basic tools like a computer so that children can be a part of our changing society. Unfortunately, these basic necessities aren't affordable for someone making today's minimum wage. People who make minimum wage -- which ranges at the state level from $7.25 an hour to $10.50 -- often hold multiple jobs just to keep up. As a result, there isn't enough time in the day to sleep, let alone have an American dream. As business and political leaders, we have a role to play in improving this reality. We founded Chobani in 2007 with just five employees in a shuttered factory in upstate New York. Today, we employ over 2,000 people across the country, spread out between two manufacturing facilities in upstate New York and Idaho and two offices. In our relatively short journey, we've become proof that profits and paying good wages are not mutually exclusive. 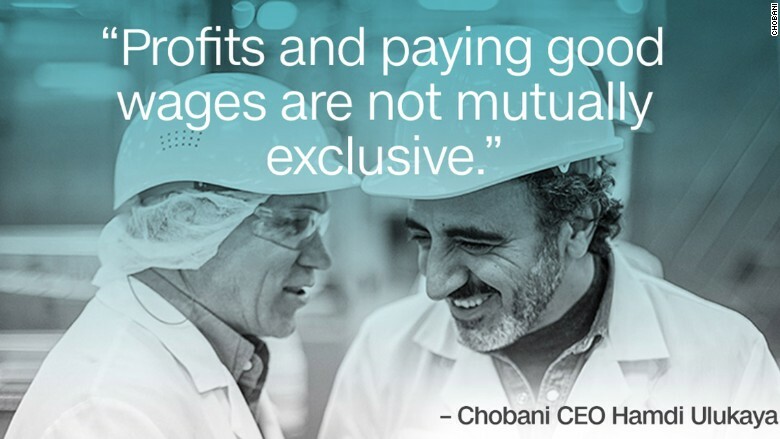 Every member of Chobani is offered well above state and federal minimum wages — the average wage at our plants is close to $15 per hour — as well as full healthcare benefits and a company-sponsored retirement plan. We think that's an important part of our success. Higher wages help us keep and motivate passionate people. Finding and training new members of our team is ultimately a tax on our productivity. And replacing an employee can cost up to double his or her salary in lost knowledge, not to mention hiring and training time. With many of our original employees still working with us at our plants, we're proof that the long-term benefit to our company and our community far outweighs the short-term cost. We understand that not all businesses can follow this path on their own. Because Chobani is a private and independent company, we have the freedom of following our own conscience when it comes to our business practices. Others may have to worry about shareholders and the impact of higher wages on quarterly profits, even when there is a long-term benefit. That is why an increase in the minimum wage is important. It gives companies the permission to do the right thing without suffering a competitive disadvantage. And it's why I'm supporting plans like those introduced by Governor Cuomo in New York, the state in which Chobani was founded and has a significant amount of our operations. Cuomo wants to gradually increase minimum wages over the next several years to $15 an hour. We're planning to meet and beat this schedule, and we're well on our way. New Berlin is my home, and many small business owners and farmers here are worried about increasing the minimum wage. I completely understand that, which is why it's really important that these plans are gradually phased in and that the concerns of farmers and small businesses are met. But I also believe that large companies like ours have a greater responsibility to the people who've contributed to our success. For us, and for many companies across New York and much of the rest of the country, that's someone like Eric. Now, for the sake of our communities and our people, we need to give other companies the ability to create a better life for more people. Hamdi Ulukaya is the founder and CEO of Chobani. The opinions expressed in this commentary are his.